Mutualistic symbiosis, the process by which organisms of different species interact so that all of them benefit, is a very common phenomenon in creation (see here, here, here, here, and here for a few examples). A recent study in the Proceedings of the National Academy of Sciences, USA highlights a very interesting case of mutualistic symbiosis that not only has some important implications for farmers, but also relates to the creation/evolution controversy. Mechanisms underlying the insecticide resistance may involve alteration of drug target sites, up-regulation of degrading enzymes, and enhancement of drug excretion, which are generally attributable to mutational changes in the pest insect genomes. In other words, when an insect develops resistance to an insecticide, it is generally assumed that there was a change in the DNA of the insect. A mutation might have damaged the site where the insecticide is supposed to bind; the activity of a gene involved in the destruction of unwanted chemicals might have been enhanced so that the insect destroys the insecticide; or perhaps the activity of a gene involved in getting rid of waste is enhanced so that the insect just excretes the insecticide. The authors show that for the specific case of fenitrothion resistance in bean bugs and similar insects, none of these mechanisms play a role. Instead, bean bugs develop their resistance to fenitrothion thanks to a bacterium from the genus Burkholderia that lives in their gut.2 The symbiotic relationship between this bacterium and bean bugs has been known for quite some time. According to the authors of the study, the larvae of the bean bugs (which live in the soil) acquire the bacteria (which also live in the soil). By the time the larvae have matured into adults, they generally have about a hundred million of the bacteria living inside them. Adults that have the bacteria grow larger than those that don’t have the bacteria, which demonstrates that even without insecticide, the bacteria are beneficial to the insects. In places where fenitrothion is used, however, the insects benefit from the bacteria even more. It turns out that some strains of these bacteria are able to digest and use fenitrothion, but others are not. As a result, when the insecticide is sprayed on crops, strains that can digest it have a big advantage compared to those that can’t, and they quickly become the dominant strain of the bacterium. Bean bug larvae that live in the soil then pick up these fenitrothion-digesting bacteria, and as a result, they become resistant to the insecticide. Obviously, then, bean bugs do not become resistant to the insecticide because of changes to their DNA. Instead, they become resistant to the insecticide because they pick up bacteria that make them resistant to the insecticide. But what about those bacteria? How did they become able to digest and use the insecticide? While it is tempting to think that they developed this ability because of a change to their DNA, that probably isn’t correct. As I have already pointed out, we now know that bacterial genes for antibiotic resistance existed back when mammoths were alive, so they were not formed in response to modern antibiotics. The most likely explanation for fenitrothion digestion in bacteria, then, is that some strains of the bacteria have always had the genes necessary to digest the insecticide, and the use of the insecticide just makes those strains more likely to survive. So how does this relate to the creation/evolution controversy? I see two implications. First, as the authors themselves say, it is tempting to explain insecticide resistance as an evolutionary change to an insect’s genome. However, that clearly isn’t always the case. Just because an insect suddenly develops resistance to an insecticide, we can’t immediately assume that it is the result of a genetic change that has been acted on by natural selection. It could be the result of a symbiotic relationship, as has been shown to be the case here. Second, some creationists maintain that the initial design for bacteria, viruses, and many fungi was purely beneficial to plants, animals, and people. In their view, these microscopic entities acted as a “bridge” that linked plants, animals, and people to their chemical-rich environment. In other words, they acted like tiny chemical processing plants, converting the chemicals in the environment into chemicals that the larger organisms could use. This study seems to support that view. In this case, a chemical that was introduced to the environment and could have harmed the insects was degraded by bacteria so that, at minimum, the insects were not harmed. While the study didn’t touch on this, since the bacteria benefit from the chemical, it is reasonable to assume that the insects benefit as well, at least indirectly. If that’s the case, the bacteria transformed a potentially deadly chemical into something beneficial to the insect. If nothing else, the study shows that God designed different ways for the organisms in His creation to adapt to changes in their environment. Genetic change is one way, but there are clearly others, some of which have not been studied very closely. 1. 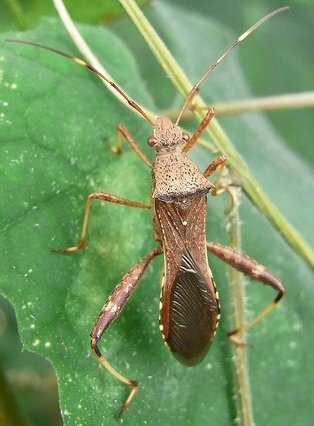 Eunmok Kim and Un Taek Lim, “Fruits of apple and sweet persimmon are not essential food sources for Riptortus pedestris (Hemiptera: Alydidae) which causes fruit-spotting,” Journal of Asia-Pacific Entomology 15(2):203–206, 2012. 2. Yoshitomo Kikuchia, Masahito Hayatsuc, Takahiro Hosokawad, Atsushi Nagayamae, Kanako Tagoc, and Takema Fukatsud, “Symbiont-mediated insecticide resistance,” Proceedings of the National Academy of Sciences, USA doi: 10.1073/pnas.1200231109, 2012. I had not considered a scenario such as this before. Thank you for bringing it to my attention. Because some of the bean bugs are able to process fenitrothion into something useful (or at the very least neutralize it), the continual use of fenitrothion will eventually lead to a population of bean bugs that all have the bacteria necessary to utilize it. And it seems, as far as we currently know, that the bean bugs that can process fenitrothion are not harmed in another way. If they were, we could target the new weakness. If this is all correct) Wouldn’t that mean that we would need to come up with another pesticide? One that works differently or does create a weakness that can be exploited even if the insect does develop immunity? These symbiotic relationships really are fascinating. D. Perrine, they are very fascinating. You are correct that the continued use of fenitrothion will produce a strong population of resistant bean bugs. Thus, I suspect that after a certain period of time, the farmer would have to change the insecticide. That way, the fenitrothion-resistant bean bugs wouldn’t be favored. Of course, that insecticide would probably result in the buildup of other resistant insects. However, if the farmer keeps rotating insecticides, he would probably get reasonable control. There is always research being done on new insecticides, specifically to combat the resistance problem. However, based on the wide variety of adaptation mechanisms in creation, it’s not clear that we could ever develop an insecticide that doesn’t produce some resistant insects. Correct me if I’m wrong, but it almost seems like these bacteria are over designed. They seem able to deal with conditions that they would never have had to deal with before. I wonder if their genes potentially code for a very large amount of different possible chemical combinations beyond just fenitrothion. If the range is very wide, a plausible explanation should be that they are designed, much the same as a computer program, to deal with many possible outcomes from someone who already knows all the different chemical combinations. I also wondered Dr Wile, what is the evolutionary explanation for why these bacteria most likely have always had, (or even for the past couple thousand years) the ability to convert this chemical into usable energy? It would be interesting to run many more experiments and see just how far bacteria can go in converting various chemicals in their environment into usable energy for themselves and/or their host. It would be a good test of the idea that microscopic entities acted, (and still act) as a “bridge” that links plants, animals, and people to their chemical-rich environment. Eric, I wouldn’t say that the bacteria are over designed. While this particular chemical doesn’t exist in nature, I suspect that there are natural chemicals that participate in similar biochemical pathways. I just think the bacteria have been designed to deal with a variety of chemicals, and as you say, the design probably involves genetic “modules” that can be used in different combinations to counteract a wide variety of chemicals. Please understand that we don’t know these bacteria have always been able to use fenitrothion. We know that bacteria have had genes for antibiotic resistance since the time of the mammoths, so I think it is reasonable to assume these bacteria have had the ability to digest fenitrothion for a long time. Now if that is the case, I think the evolutionary explanation is the same as the explanation for the genes that promote antibiotic resistance. Some organisms have the ability to make chemicals that kill bacteria, so it makes sense that bacteria should have evolved genes to fight those chemicals. Since our antibiotics probably exploit the same biochemical pathways, the genes that evolved to fight those naturally-occurring chemicals can also fight antibiotics. In the same way, there are probably naturally-occurring chemicals that exploit the same biochemical pathways as fenitrothion, so it makes sense that some bacteria would evolve resistance to them. Those genes probably help the bacteria digest fenitrothion.